Kyle Bennett's brace made sure of all three points for Pompey. Portsmouth made an impressive start to their season as they outclassed Dagenham & Redbridge at Fratton Park. Dagenham frustrated their hosts in the first half, but could not live with the home side after the break. Gareth Evans gave Pompey the lead when he headed in from a Kyle Bennett corner, before Bennett doubled the lead with a crashing drive in off the bar. Bennett sealed the game when he unleashed a brilliant effort from 25 yards to cap a fine performance. "I'm just happy for everyone at the club, so much work went into today's game. "I'm happy now that game's gone. I think it's important to get that one out the way and I can focus now on a long season, a tough season, hopefully managing this club to a bit of success. "I thought the lads showed good patience. All in all it's a really good day for us." On Kyle Bennett's brace: "They were quality so fingers crossed he can keep it going. He's a good player and there's a little bit of expectancy on him to perform and do well." Corner, Dagenham and Redbridge. Conceded by Matthew Clarke. Attempt missed. Christian Burgess (Portsmouth) right footed shot from outside the box is just a bit too high. Attempt missed. Jodi Jones (Dagenham and Redbridge) left footed shot from outside the box misses to the right. Substitution, Portsmouth. Jayden Stockley replaces Kyle Bennett. Goal! Portsmouth 3, Dagenham and Redbridge 0. Kyle Bennett (Portsmouth) right footed shot from outside the box to the top right corner. Assisted by Gary Roberts. Substitution, Portsmouth. Danny Hollands replaces Nigel Atangana because of an injury. Delay in match Nigel Atangana (Portsmouth) because of an injury. Corner, Portsmouth. Conceded by Nyron Nosworthy. Goal! Portsmouth 2, Dagenham and Redbridge 0. Kyle Bennett (Portsmouth) right footed shot from the centre of the box to the high centre of the goal. Assisted by Enda Stevens. Attempt missed. Christian Burgess (Portsmouth) header from the centre of the box misses to the left following a corner. Corner, Portsmouth. 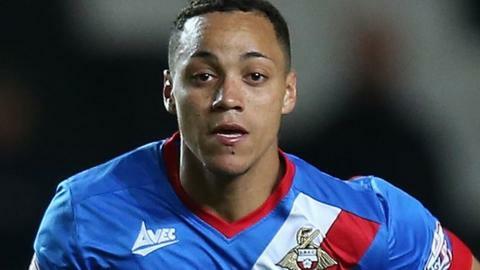 Conceded by Joe Widdowson. Kyle Bennett (Portsmouth) wins a free kick on the left wing. Kane Ferdinand (Dagenham and Redbridge) wins a free kick in the attacking half. Attempt saved. Enda Stevens (Portsmouth) left footed shot from outside the box is saved in the centre of the goal. Attempt missed. Matt Partridge (Dagenham and Redbridge) header from the right side of the six yard box is just a bit too high following a corner. Goal! Portsmouth 1, Dagenham and Redbridge 0. Gareth Evans (Portsmouth) header from the centre of the box to the bottom left corner. Assisted by Kyle Bennett with a cross following a set piece situation. Second Half begins Portsmouth 0, Dagenham and Redbridge 0. Substitution, Dagenham and Redbridge. Kane Ferdinand replaces Matt McClure. First Half ends, Portsmouth 0, Dagenham and Redbridge 0. Attempt missed. Gareth Evans (Portsmouth) left footed shot from outside the box is close, but misses to the right. Matt McClure (Dagenham and Redbridge) wins a free kick on the left wing.